The day started out cold and damp but got warmer and sunnier as the morning progressed. 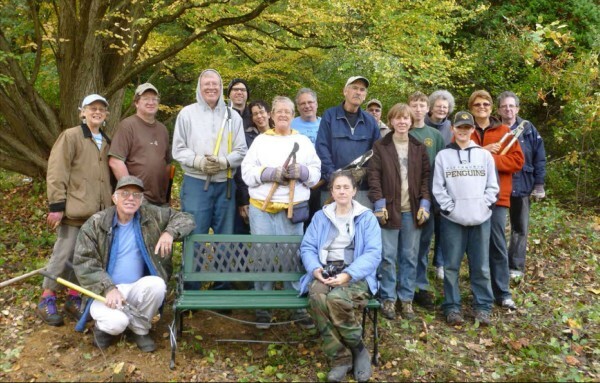 Eighteen intrepid nature lovers , representing Wissahickon Nature Club, Botanical Society of W. PA, Boy Scout Troop 368, Friends of N. Park and Penn State Master Gardeners, worked to clear the area under the Katsura tree of invasive wild grape, multi-flora rose and buckthorn so that a bench could be erected and cemented into the ground in honor of Esther. We also planted a persimmon tree that was purchased by the Wissahickon Nature Club. With the tree firmly planted, we headed to the Grant Grove to have hot apple cider, hot soup and cookies. After lunch, Dianne Machesney led a walking tour of the arboretum from 1:00 to 3:00 PM talking about some of the nicer specimens, including, Black Gun, Sweet Gum, Flowering Dogwood, Hackberry, Umbrella Magnolia, Cucumber Magnolia, Osage Orange, Lacebark Elm, Sugar Maple, Shagbark Hickory, Eastern Red Cedar, Black Ash and Cork Tree. We also studied a few shurbs with interesting fruit: Asiatic Sweetleaf, Linden Arrowwood and Winterberry. Many Closed Gentian were also still in bloom in the area that was cleared last year, proving that our hard work does make a difference. Meg Scanlon, North Park naturalist, expressed her thanks to all. Click here for a PDF showing photos of the day’s activities.